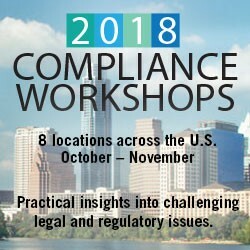 The IAA Compliance Workshops are an excellent opportunity to gain practical insights into challenging legal and regulatory issues facing SEC-registered investment advisers, and to meet compliance and legal professionals from other IAA member firms. This workshop will address important compliance-related topics for SEC-registered investment advisers. Click here for detailed information about the speakers for this workshop. Hear members of SEC Headquarters or SEC Regional Offices discuss current examination priorities for advisers. Learn about key regulatory developments and the latest updates from Washington from IAA attorneys. Learn how to draft effective disclosure documents and other material and identify how to avoid common pitfalls in drafting Form ADV and other disclosures. Dive into common compliance program testing techniques that were surveyed in IAA’s 2018 Compliance Testing Survey. Compare best practices and learn about strategies and guidelines for maintaining a robust and responsive compliance testing program, including reviewing and testing various fees and expenses. Discuss managing electronic communications, including issues around recordkeeping, social media, email, Cloud storage, device management, and cybersecurity. The panel and attendees will discuss compliance with Advisers Act rules and other relevant regulations, as well as best practices. In addition to SEC staff, speakers will include attorneys from nationally recognized law firms, CCOs, compliance consultants, and IAA legal staff. The workshop will include a networking luncheon at which attendees can exchange ideas about shared compliance concerns. NCS Regulatory Compliance is the nation’s premier regulatory compliance consulting firm and offers the deep investment adviser and broker-dealer expertise that makes the critical difference to our clients. The have garnered industry respect from both clients and regulators by providing over 25 years of high quality and knowledgeable compliance consulting to thousands of firms throughout the country. Their knowledgeable consultants work closely with you providing dedicated support to assess your compliance needs and develop a proactive strategy that is effective and easy to implement, while anticipating and planning for regulatory changes. NCS Regulatory Compliance will help you avoid compliance issues, giving you peace of mind and the opportunity to focus on your core competencies. Their services include Registration Solutions, Mock Examinations and Testing, Regulatory Exam Assurance, Ongoing Compliance Programs, CCO Assistance and Training Programs, Regulatory Accounting and FINOP Support, Customized Compliance Manuals, Technology Solutions, Advertising and Website Review, and Cybersecurity Assessments. For more information, visit https://www.ncsregcomp.com. Click the “Register” button on this page. *Employees of firms that are current members of the Investment Adviser Association (at the time of registration and on the day of the meeting) are eligible to receive the member firm rate. Consent to the Use of Registrant’s Image or Voice: Registration and attendance at, or participation in, IAA live events constitutes an agreement by the registrant that IAA may use and distribute the registrant’s image or voice in photographs, videotapes, electronic reproductions and audiotapes, both now and in the future. If you find it necessary to cancel your workshop registration, IAA will refund your registration fee (less $50 administration fee) if you inform us on or before October 31. No refunds will be made after that point. There will be no refund for “no shows.” Notice of cancellation must be received in writing at iaaevents@investmentadviser.org. Substitutions may be made at any time at no additional fee. Please let us know if you have any questions regarding the administrative policies by contacting the IAA office at (202) 293-4222. Contact the IAA at (202) 293-4222 or iaaevents@investmentadviser.org. Information regarding IAA’s Financial Hardship Policy is available here. The workshops are approved for NRS Investment Adviser Certified Compliance Professional® (IACCP®) continuing education credit. CLE accreditation is pending in CA, GA, and TX. NH: The provider believes this course meets the requirement of NH Supreme Court Rule 53. Under New York’s Approved Jurisdiction policy, New York attorneys may claim credit earned through participation in out-of-state courses accredited by a New York Approved Jurisdiction. More information is available on the NY State Bar website. For more information or to request that your state be included, please contact Megan Olson. Additional information will be available soon. CPE credit is available for the IAA Compliance Workshops. Exact credit hours will be available when the agenda is published. The IAA Compliance Workshops are presented in a group-live setting, and is appropriate for intermediate and advanced skill levels. Previous courses in securities law, or comparable work experience in the investment advisory industry is required. Advance preparation for the event is not required. The Investment Adviser Association is registered with the National Association of State Boards of Accountancy (NASBA) as a sponsor of continuing professional education on the National Registry of CPE Sponsors. State boards of accountancy have final authority on the acceptance of individual courses for CPE credit. Complaints regarding registered sponsors may be submitted to the National Registry of CPE Sponsors through its website: www.learningmarket.org.